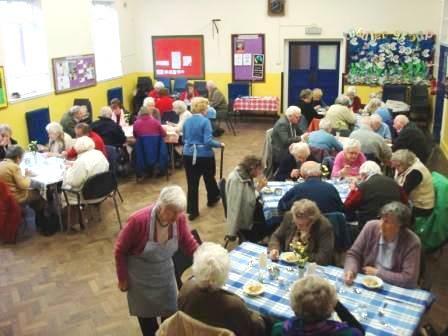 For pensioners to get out, and meet others, and have a chat over a meal. The 6.5 Senior Lunch Club has been meeting here in Lapal for nearly 30 years and clearly meets a continuing need. We meet once a month on a Monday to provide an opportunity for those who are retired or live alone to meet and chat with other folk from around the neighbourhood. Gathering in the Hall from 12:30 for 1.00pm the diners enjoy a two course meal freshly cooked on the premises, with time for a natter over tea or coffee afterwards. There is a small charge for the lunch. If carers and visitors feel that a person would benefit from a change of scenery, to get out and meeting others to reduce isolation, please get in touch––– not forgetting also the ‘Over 50’s Club’ on alternative Thursdays.